When I was young, probably age 14, the boys in our neighborhood went through a BB gun phase. Prior to this, I had never had any exposure to firearms at all, beyond cap pistols. I got a lever action Daisy gun, from where I don’t remember. Others in the neighborhood had pump pellet guns, and one guy, the rich kid on the block, had a CO2 powered semi-auto. In the afternoons after school, we would meet at John’s house, a couple of houses down from mine, and choose sides, the head into the woods to do battle. Full on BB wars. The rule was, one hit and you were out, and it was on an honors system. Not too difficult to enforce. I can still remember being shot. Ouch. Late one session, as it was getting almost too dark to see, I was trying to flank the other team’s position, and I heard movement behind me. I turned, and there, probably 30 yards away, through the trees, was the captain of the other team. John. John was large. That is, while I, at age 14, was probably 5′-8″ tall and weighed 140 pounds, John was easily 6 feet tall and probably weighed over 200 pounds. We all thought he was fat, although we didn’t say that to his face. But there he was, and he didn’t see me. So, I raised my gun quickly, and fired. John cried out, and put a hand to his face. I rushed to his side, and sure enough, even in the fading light, I could see that his eye was red, although there didn’t seem to be blood on him anywhere. So he and I made our way through the woods, back to his back yard, where some of both teams had come to retire, and they could all tell right away what had happened. We took a couple of minutes trying to decide how we were going to handle this. We quickly came up with a plan. 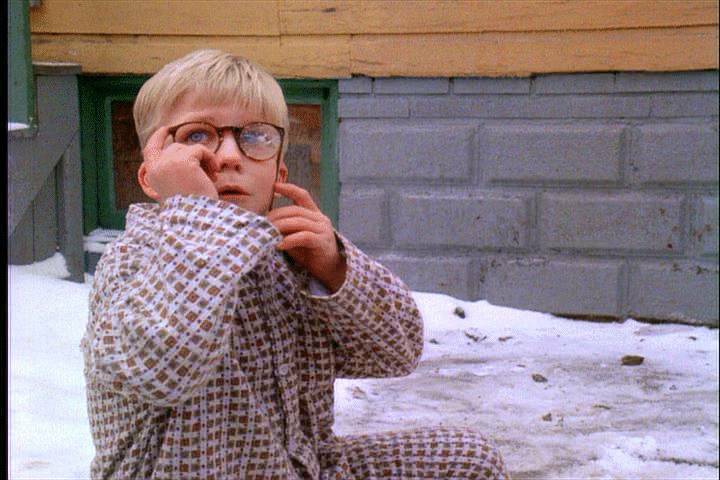 First, yes, this sounds like what happened to Ralphie in A Christmas Story. But we thought of it first. In the woods we had an old metal sign, and, as dumb as it sounds, we would tape pictures of animals to it and shoot it for target practice. We all thought it was funny when BBs would come back and hit near us, or fly off into the woods. So the story was that the BB had come straight back and hit John’s eye. Easy. Well, John’s Mom didn’t panic when she saw him, but quickly swept him off to the doctor’s to be sure. Those who remained, we few, we happy few, we band of brothers, we breathed a sigh. The next day, Friday, when we got home from school, all our Moms had some news for us, courtesy of John’s Mom. The BB had struck John’s eye just below the iris, and had almost penetrated the eyeball. But it didn’t, and that was the good news. From there, it had skidded along the surface of his eyeball, and gone under his eyelid, lodging up under his cheek. They almost couldn’t find it, but X-rays are a wonderful thing. There was no joy in the neighborhood, because we were all sure the BB wars were over, as much as we were scared of John’s prospects. John didn’t want to hang out with any of us, which was understandable, because he had been forced to take the blame for shooting himself. The next day, Saturday, when all the Dads were home, was sure to be the worst. Yet, as the day dawned, there were no lectures, no confiscations, no gun raids. Instead, one of the Dads went out to Sears, and brought back a whole bunch of work goggles, and made sure all we combatants had a pair, and that we agreed not to shoot, anywhere, any time, anyone, without them. And the BB wars continued, at least until about the time a bunch of us got our drivers licenses and discovered girls. From that point, everyone in John’s family started calling me Deadeye, and it was then that I knew that John had told the real story. Years later, when I visited the old neighborhood, John was there, visiting his parents, and the topic got around to my nickname, and he admitted it. I asked him why he chose Deadeye, and he explained that I had to be the best shooter in the neighborhood – given the size of his eye in comparison to the rest of his body, that was some fine shooting. John recovered full use of his eyes, and never held ill will toward me. I guess the nickname did a lot. And thanks to the calm response of the parents in the neighborhood, nobody got their eye shot out again.